Australian Sally Thomas recently returned from an assignment in northern Yemen. As project coordinator in Hajjah, she witnessed the day-to-day reality of Yemenis living with crippling conflict. With the conflict in Yemen now into its fourth year, all aspects of people’s lives are restricted and affected. Yemenis face the loss of paid work, limited education opportunities, food and resource shortages and limited access to healthcare services. Many people have been directly touched by the trauma of war, and many live in constant fear for their personal safety and that of their family members. In Hajjah, a small city where some Yemenis have relocated during the war, MSF is supporting a local tertiary hospital (a large referral hospital) to continue operating following the loss of government funding. Our focus is to provide support to the emergency department, which admits almost 3,000 people each month and includes five operating theatres, a 10-bed intensive care unit, inpatient departments of 130 beds and maternity services. 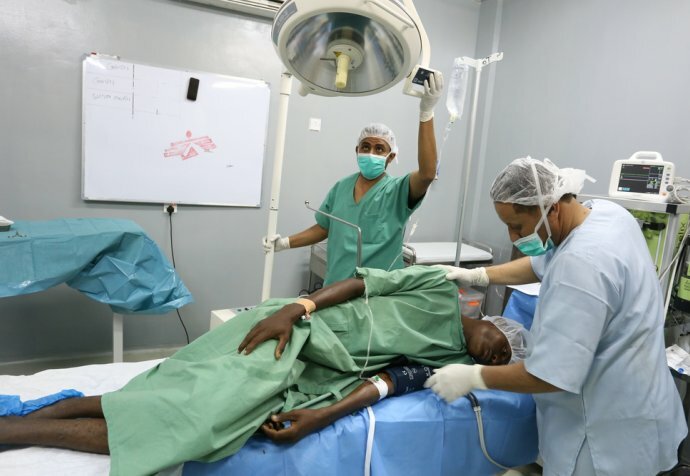 We are also treating people with complicated injuries or conditions, who have been referred from surrounding health clinics and hospitals, and severely injured patients from the frontline. The majority of patients require surgery, including orthopaedic, visceral (to treat trauma of the abdominal organs), neurological and burns interventions, and must undergo a long recovery process. "As project coordinator, I focused on fostering and maintaining positive relations with local community members, government and military officials and other international NGOs, ensuring our team could provide quality medical care." Currently, Hajjah hospital is relatively accessible for most patients, but we know many are travelling long and sometimes complicated journeys to reach us, which often results in patients arriving too late for medical intervention. Others are just not able to make the journey. Military checkpoints limit the free movement of people, the price of fuel is often highly expensive, and public transport is limited. Due to the high security setting, our teams are only aware of the patients that successfully arrive at the hospital. This makes it difficult for MSF to accurately gauge the gaps in medical care in the area, but it is evident that many people are not able to reach the care that they urgently need. The conflict also places pressure on the level of care we can provide. Quality medical equipment and medicine can be hard to obtain and it is difficult to maintain a team of highly skilled staff. We rely heavily on the impressive dedication of our team of Yemeni and international staff. We also require strong community acceptance to ensure we can operate with independence and impartiality. As project coordinator, I focused on fostering and maintaining positive relations with local community members, government and military officials and other international NGOs. I enjoyed the unique opportunity to immerse myself with the community, whilst ensuring our team could provide quality medical care. "The patients were all still wearing their celebratory wedding outfits, heads decorated with wild jasmine flower crowns. All required emergency surgical interventions." In April this year, there was an airstrike that hit a wedding in a village outside Hajjah city. I received a call informing me that we were expecting a mass casualty. I don't think I will ever forget the days that followed this call. There were hours of receiving critically injured civilians piled into ambulances and cars, often five to six patients per ambulance; medical staff working continuously for days to treat the patients; and the local community arriving at the hospital into the early hours of the morning to donate much needed blood and provide food and support to patients and caretakers. The patients ranged in age from 11 to 60 years old, all still wearing their celebratory wedding outfits, heads decorated with wild jasmine flower crowns. All required emergency surgical interventions. The children were too scared or in too much pain to cry. This event was just another example of the reality of war for Yemenis – and how participating in a simple joyful event such as a wedding can come at a great cost. It is encouraging to see the deep gratitude that people have for the assistance that MSF supports and provides. I hope we will be able to continue our services as long as there is a need in the area, but in a conflict zone, you never know what each day will bring. The context can change without warning, and the thought of whether we will be able to access the people that need us is on our minds constantly.